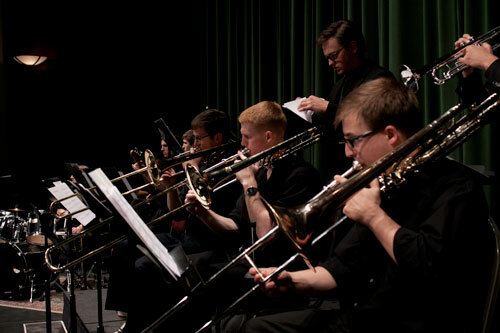 On Tuesday, November 15, 2016, the Jazz Ensemble from the Southern Utah University Department of Music will perform an action-packed concert of Jazz legend pieces. The concert will be held in the Sharwan Smith Center Living Room at 7:30 p.m. This Legends In The Living Room concert is free and open to the public. The pieces that will be played during the concert include TANK (Theme from Cowboy Bebop), A Night In Tunisia, Take The A Train, In The Mood, April In Paris, Our Love Is Here To Stay (with vocals), It Don't Mean A Thing If It Ain't Got That Swing (with vocals), and Sing Sang Sung. Enjoy this energy packed performance by the Southern Utah University Jazz Ensemble on Tuesday, November 15, 2016. For more information, please visit the Jazz Ensembles.